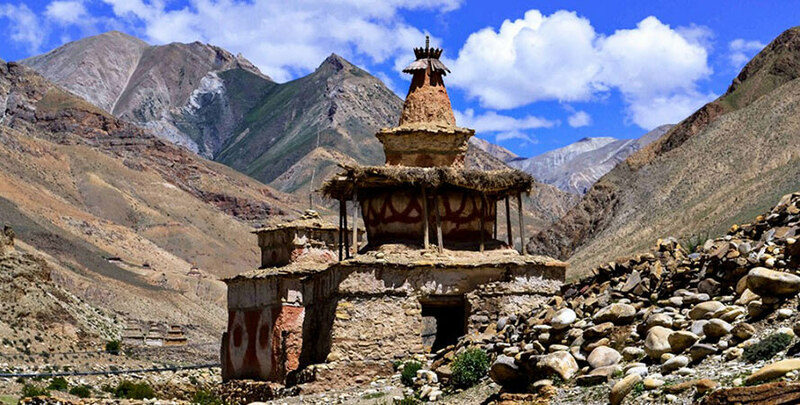 Upper Dolpo and Shey Gompa trekking carries you into an otherworldly arrive where hundreds of years old Buddhist and Bonpo customs, joined with shamanistic impacts, are still an essential part of day by day life. 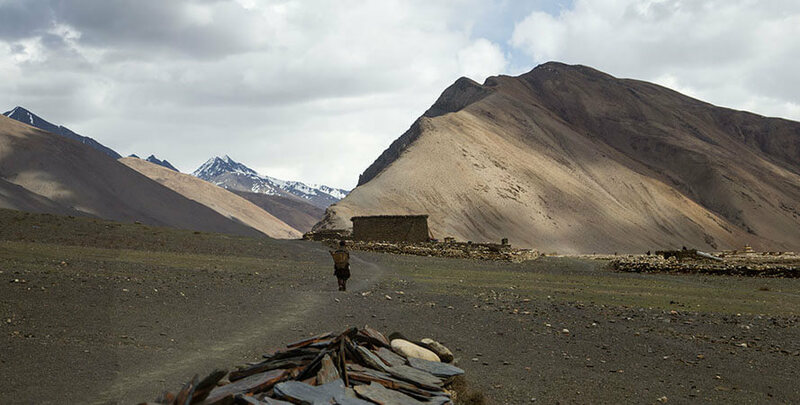 The villages, Gompas and individuals you meet throughout this trek will leave a remarkable impact on you. You must be self-ready as you need to stay above 4000 meters for quite a while in extremely frosty nights. But, the unforgettable scenes, the perspectives from the passes and the contacts with an exceptionally extraordinary untouched society make everything worth. The landscapes here are even more desolate and the villages even more isolated and pure. 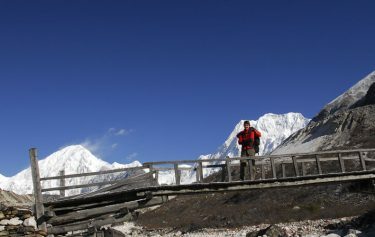 Upper Dolpo and Shey Gompa Trekking is amazing hike as we need to cross three high passes, Nagdalo La, the Shey La and Jeng La.­ Our trek begins from head out to Nepaljung and fly to Juphal (upper Dolpo). From Juphal we stroll through Tarakot and turn north to Tarap valley. Inside 5 days we arrive at Do Tarap. We rest at Do Tarap for a day and cross high pass at an elevation of 5000-meter like Jangla and several other. 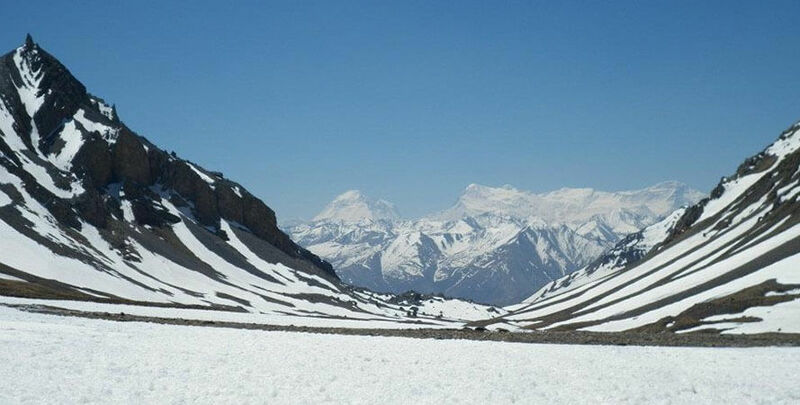 These passes are generally covered with snow and also known as the hardest part of this trek. From the pass you can see rolling mountain that amplifies to Tibet. Upper Dolpo and Shey Gompa trekking further brings us to Shey Gompa our main destination often referred to as heart of Upper Dolpo. It’s an enchanted place, arranged at the base of Crystal Mountain. A day later rest at Shey Gompa we cross the high pass at Kangla. Descend towards Phoksindhu Riverand and accompany the waterfall trail to Phoksindhu Lake and finally walk to our beginning point Juphal and fly out to Kathmandu. Dolpo Region could be partitioned into four valleys, each of which is represented by a village development committee namely Dho (Tarap Valley), Saldang (Nankhong Valley), Tinje (Panzang Valley), and Chharka (Tsharka Valley). 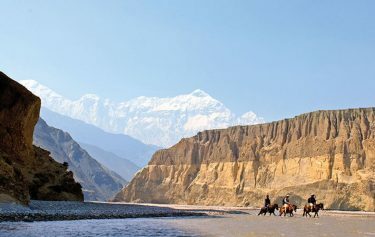 Upper Dolpo is a restricted zone, for which a charge of US$ 500 for the first 10 days, and US$ 50 for every extra day. 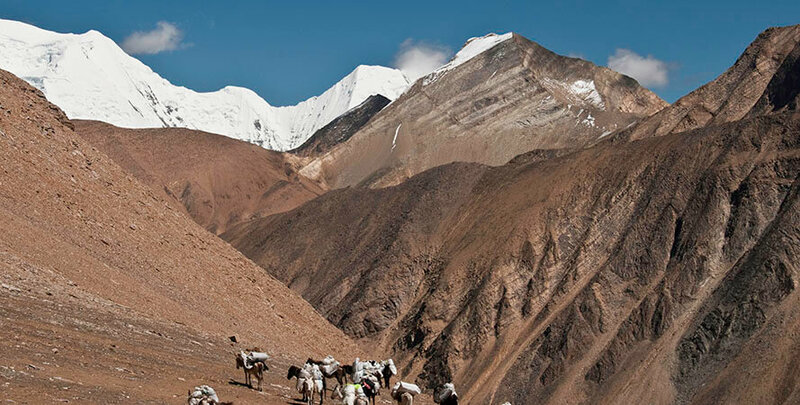 In addition, there is a greatest number of foreigners that can enter Inner Dolpo each year. 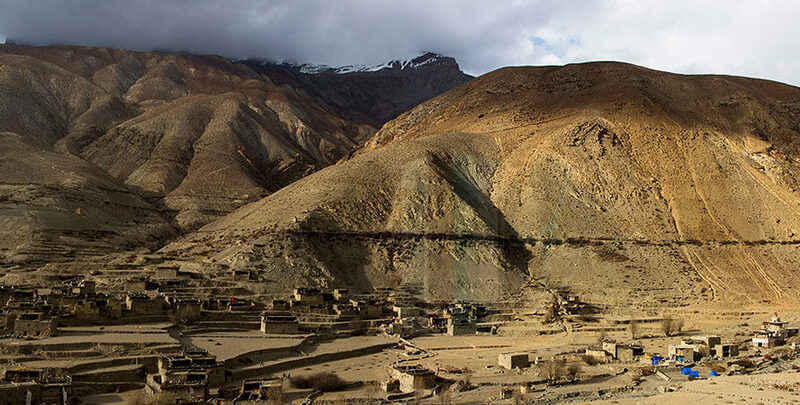 This makes Upper Dolpo and Shey Gompa Trekking an extremely extraordinary and exclusive experience. In another hand Upper Dolpo and Shey Gompa Trekking also gives a best opportunity to visit Jungle Safari in Bardia National Park which is a closest National park to see an activities of Tiger. The Bardia National Park can visit after finishing our trek where end at Nepalgunj and and two hours drive after the trek end. This National Park is specially for watch Tiger and their activities. Trip Highlights of Upper Dolpo and Shey Gompa Trekking. Cross three high passes of 5000 meters and above with spectacular views over the snow-capped Himalaya.Visit the magical Shey Gompa, the spiritual heart of Inner Dolpo. Sleep in authentic, Buddhist villages and camp in amazing spots amidst the snow capped mountains.Have encounters with villagers, who are direct descendants of the Tibetans. See Nepal’s highest waterfall, the Phoksundo Waterfall, of 167 meters high. Day 04: Flight to Juphal from Nepalgunj. Day 11: Lar Tsa to Shey Gompa. Day12: Rest Day - Shey Gompa. Day16: Sibu to Tokyo Gaon. Day17: Tokyo Gaon to Dho Tarap. Day18: Dho Tarap to Serkam. Day22: Flight from Juphal to Nepalgang early mooring ( 35 Min) - same day flight back to Kathmandu from Nepalgunj. Day 03: Flight to Nepalgunj. 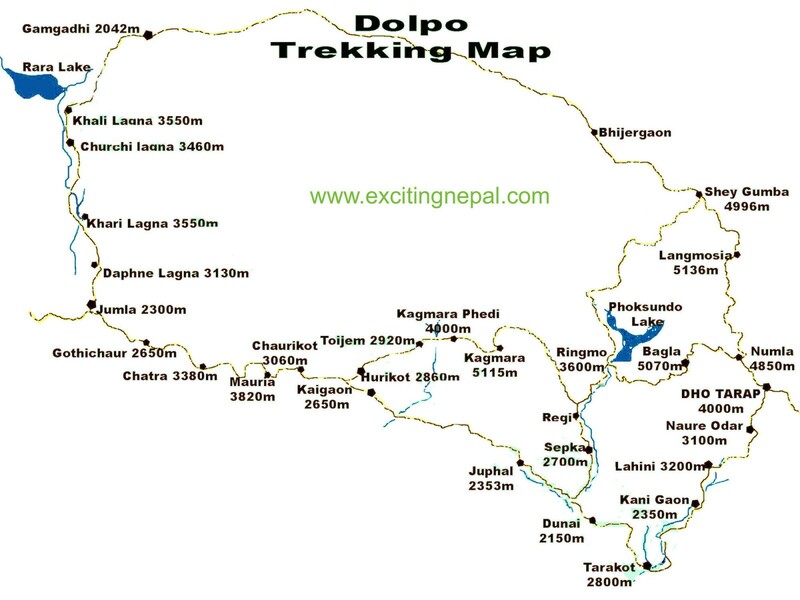 (150m)Generally we go via Nepalgunj to get to Dolpo so, firstly we will fly to Nepalgunj and spent food time in Nepalgunj. Nepalgunj is situated in south western part of Nepal a steaming hot city. (2838m) - 6 hrs WalkFrom Juphal, we have to descend through wheat and vegetables field to reach Thuli Bheri River. A big suspension bridge will lead us to the entrance of Shey Phoksando National Park (SPNP), Nepal’s largest National Park with the area of 3,555km/sq. It is comprising the Trans Himalayan ecasy stem and the Tibetan type of floras and faunas. 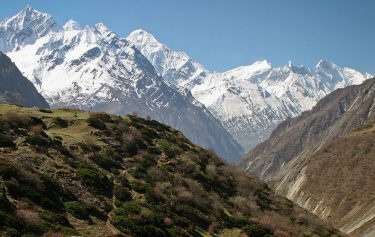 We will follow Suli Khola viewing a part of the Dhaulagiri Range.we will trek through the trail surrounded by pine tree line spruce, At the end of the day we will reach Cheep Ka, a small village surrounded by millet and wheat field. Overnight at tented camp. 6-7 hrs WalkTo reach to Palma, we have to pass through beautiful forest, following a river. We have to ascend sometimes and descend sometimes. On the way we can see the local people with their mules as dzopas (cross bread of Yak and Cow). vernight at tented camp. (3620m) 4 hrs WalkIt takes about 4 hrs to reach Phoksundo Lake. We have to climb steep about 2hrs. before reaching the top, we can have the new of Nepal’s highest waterfall, a spectacular waterfall of 107m high knows Phoksundo waterfall as known as sunlight waterfall. Then we will descend from the top to get Ringmo village a small charming village. people practice it. 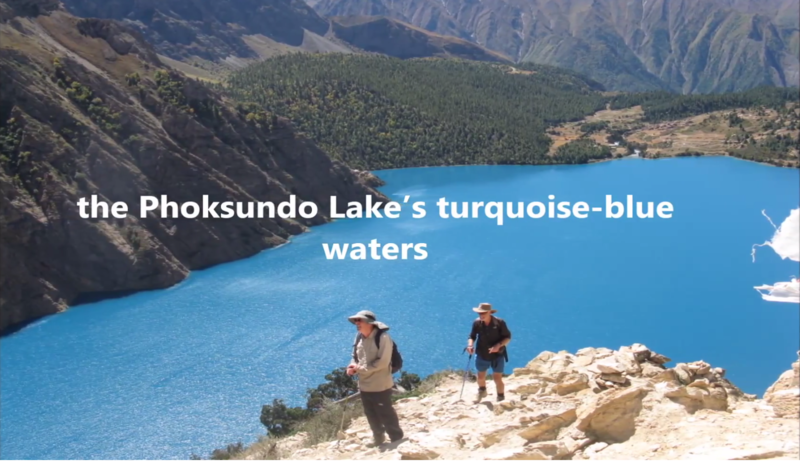 it is most that we should have rest at least for one day to admire the beauty of Phoksundo Lake and visited nearby villagers inhabited by Bon and Buddhist religion. Overnight at tented camp. (3640m) - 5-6 hrs WalkThis day, we will enter restricted area of Upper Dolpo.This trail is used by peoples of Dolpo and other trade with Tibetans. 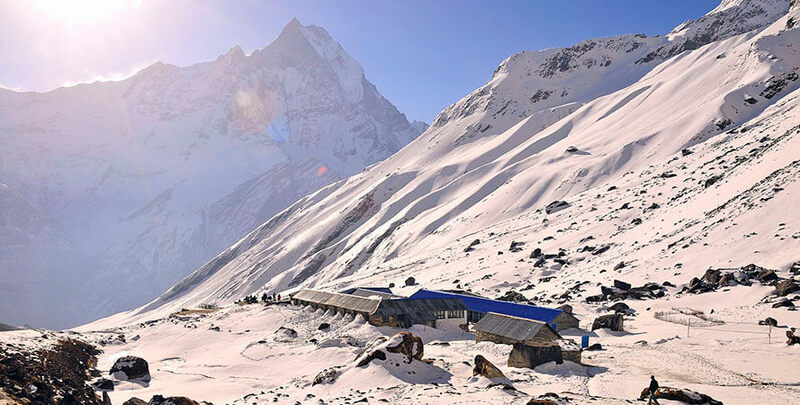 We will have to descend first and ascend through a wide valley which will let us to have spectacular view of Kanjirowa Himal (66612m) then we will reach an alpine area with junipers called Thaneba or Lake side camp, a beautiful place of camping. Overnight at tented camp. Day 10: Salla Ghari to Lar Tsa. (4320m) - 7-8 hrs WalkWe will start trek by a long and strenuous climb of about 2 and half hrs over a dusty path to Kang La (5350m), also called as Ngadra La. We have to descend through pass covered with snow which is very steeply and after about 3 hrs we will reach Shey Gompa, a very small village with a couple of houses and the Gompa. It is a 11th century gompa. we can explore around Tsakang Gompa. It is not really a monastery but a retreat. 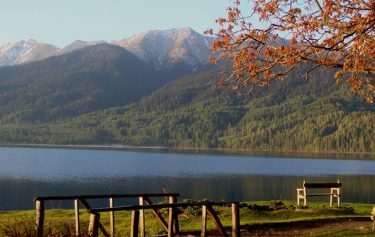 Tsakang had been a meditation centre of many famous lamas from Tibet. Shey Gompa belongs to the Chaiba community, followers of the Padmasambhava and Kagyu sects. It was the first Kagyupa monastery and its founder was the lama Ten-szin-Ra-Pa. The monastery was built during the 11th century. Shey is famous for its ancient Buddhist culture. In Dolpo the ancient Tibetan way of life combines animism with the teachings of Buddha. Drutup Yeshe introduced Buddhism in the Dolpo valley. (4430m) - 6 hrs WalkTo get to Namgung, we have to cross the pass Sheyla which is also called Geln La is about 5000m. While we are through the Glen pass, we can see beautiful view of northern part of Tibetan plateau, which is highest plateau in the world. After through pass we have to descend to the pastures of Namgung. -(4046m) - 3 hrs WalkOur Trek to Saldang starts with climbing a tree slope. We have to ascend to 4700m before going down steep slopes to picturesque village of Saldang, situated on a plateau high above the Nam Khong nala and the biggest villages of lower Dolpo area. 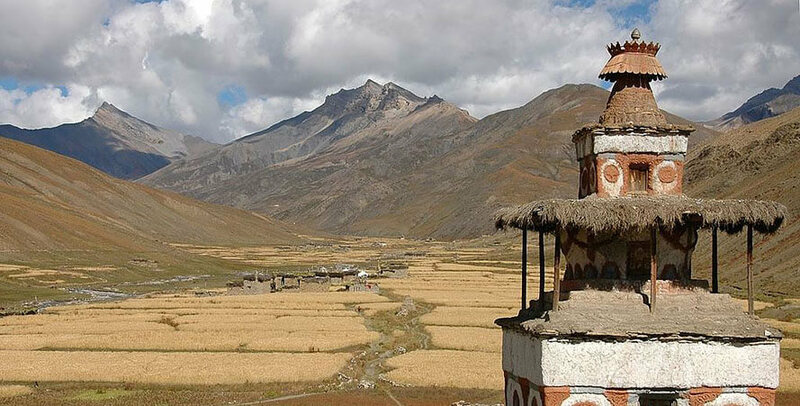 The village is prosperous, not only agriculturally but also for its strategic location on a trade route to Tibet. Overnight at tented Camp inclusive of full board meals. (4000m) - 6 hrs WalkWe will leave Saldang village and on way to Sibu we have to pass through terraced fields, Stupas, Chortens mani and a Chaiba monastery. Namdo, the next village contains sixty houses having nearby four hundred in habitants. Day16: Trek to foot of the Jengla - (4480m) - 4-5 hrs WalkWe will follow the line of the river valley and the trail is easy going initially. But after two hours, we must make another stream before turning into side valley where the rise becomes very sharp. Overnight at tented camp with full board of meals. (4240m) - 6-7 hrs Walk To reach to Tokyo Gaon we have to cross the Jeng La which is about 4850m. It will take about 2 hrs climb to reach the top of Jeng La. Form the top of the peak we can have good views of Dhaulagiri, beautiful goldy views in the morning then we will descend towards Tarap valley. By the after we will see green valley which leads us by a beautiful trail down. Towards Tarap Chu. (4200m) - 2 hrs WalkTo reach to Dho Tarap we will walk east along the downward lower of Tarap Chu. The trail is easy as it is well travelled. There are many mani walls, we can see but some of the Chhortens are in a bad situation. The “Frencch School” is just outside the village of Dho Tarap. Dho is surrounded by an irregular stone wall and consist of thirty four houses. Both Bonpo and Buddhist is inhabitant here. We will visit Buddhist Gompa where a Lama lives. He is very happy to show his monastery and might even let you see his private Gompa and the Thankas which he has made himself. Overnight at tented camp with full board of meals. (3623ft.) - 7 hrs. Route follows the course of the Tarap Khola, generally downhill. You go through narrow gorges with the river rushing through. 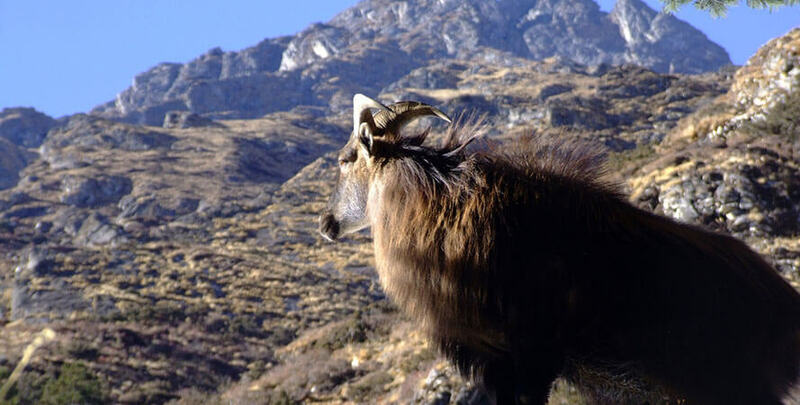 One may see blue sheep, marmots, yaks, sheep and goats and perhaps meet people from Dolpo taking their flocks of sheep and goats to lower pastures for the winter. The afternoon brings more undulations in the path when it leaves the immediate course of the river. (2109m) - 5 hrs WalkThe trail is mostly down and fairly firm underfoot. Walking beside the Bheri River you use the ingenious path built twenty feet above the river. All too soon you have reached the village of Dunai and the camp site you used before. (2404m) - 3 hrs WalkYou now retrace your steps to Juphal. Day22: Flight from Jhuphal to Nepalgang to Kathmandu. Early morning flight to Nepalganj. This is a wonderful 35- minute flight over the Himalayan foothills, with fine views of the main peaks including Annapurna and Dhaulagiri to the north. You then connect with the flight back to Kathmandu. Two night deluxe hotel in Kathmandu on B/B, Before and After the trek. Hotel Access Nepal Pvt.ltd. A cook and kitchen supporter. First Aid kit, including Oximeter and pulse meter checker. All meals in Kathmandu and Pokhara.